This went up on the island last year. I have yet to see anyone use it. It is so peaceful and inviting. I want to see someone take a book and chair and go read in it for the afternoon. Or hang a hammock in it and nap. Or sit in it at night and watch the moon on the water. Or watch fireflies from it. and that is why I haven't seen anyone there. What is the story behind this idyllic retreat? i could think of a story but it would be neither romantic or pleasant to explain it! in my mind I do believe it is an elaborate cover up for just that! A secret trysting spot for star-crossed lovers. Or a drug drop-off point. We are across the channel from Canada. 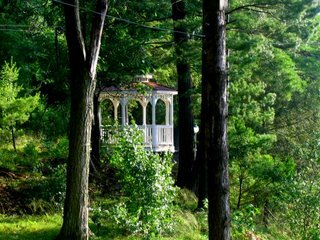 There is a dock that leads up to the gazebo. Boats I don't know do seem to go in and out of there from time to time. I like the drug drop off scenario. Time to get my night vision binoculars out. 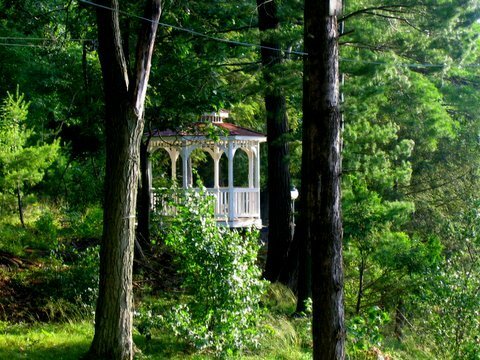 I think we all (or should) have a gazebo like that in our lives, figurative or literal...a secret little place that we can choose to share, or not. With boats known or unknown, as we decide. A quiet place deep in the woods. Here I am getting all prose-y when it might be just a Home Depot display. That's one I didn't think of!